As a pioneer in the transport of automobiles using pure car carriers (PCC), "K" Line provides services for the safe and timely transport of completely built-up cars (CBU). "K" Line entered the CBU transport service in 1970 with the Toyota Maru No. 10, Japan's first PCC. Since then, we have steadily upgraded our fleet to raise transport quality even further. "K" Line not only makes unstinting efforts to transport CBU safely and without causing damage during the loading and unloading operations and navigation, we are also making fleet upgrades to improve environmental performance. Upgrades include the use of fuel tanks placed within a triple-bottom structure to prevent oil leaks and protect the environment with enhanced fuel tank protection performance in the event of damage to the ship. We also adopted electrically controlled engines on PCC for the first time. Computer control of fuel injection timing and the opening and closing of exhaust valves reduces nitrogen oxide emissions and cuts soot and carbon dioxide during low-load operation. We are actively working to reduce environmental impact through the use of various cutting-edge technologies such as particulate matter-removal equipment that uses ceramic filters to prevent soot dispersion. 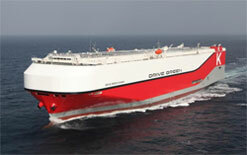 "K" Line has launched "DRIVE GREEN PROJECT" in order to pursue environmental protection and energy savings with the world’s most advanced technologies, integrated on the 7,500-unit Car Carriers ordered through Japan Marine United Corporation. On March 16, 2016 at the Onishi Shipyard of Shin Kurushima Dockyard Co., Ltd., the construction of “GLOBAL HIGHWAY,” a 7,500-vehicle car carrier, was completed. The ship is the fourth ship in the 7,500-vehicle Car Carrier Series, the largest ship type in “K” Line’s specialized car carrier fleet. Select here for more information on the "DRIVE GREEN PROJECT"
"K" Line is expanding its services provided mainly on the Atlantic routes to include routes to and from Asia as well. We are able to transport high & heavy vehicles and agricultural and construction machinery as well as oversized, static cargo using mafi trailers. We can accommodate privately own vehicles, high & heavy vehicles and static cargo. In the automobile industry, production is shifting from traditional auto production countries to newly-industrialized countries. In conjunction with this change, the transport of CBU is diversifying around the world, and we believe that this trend will continue in the future. In response to these changes, we will continue our efforts to operate various types of ships and reinforce our global-spanning service network to meet customer needs. "K" Line will ship single or multiple vehicles (RoRo for Autos, Trucks, Boats, and any kind of rolling stock) around the world.